It’s not your “common or garden” thermostat. Oh, sure, you can use the “Kill” switch on the 75F to put it back into “dumb” thermostat mode. You can even toggle between “dumb” and “smart.” But I can’t really think of any reason to return to Early Electric Age sensor technology when this incredibly clever, comfortable, and money-saving option — The New Cool from 75F — is available. I encountered this revolutionary approach to HVAC sensor technology while checking out promising green startups at the 2014 Midwest Cleantech Open. The 75F developers of the New Cool were among the competition’s 2014 Accelerator finalists, who will vie for $200,000 in investment and in-kind services at the national Cleantech Open Global Forum later this month in San Francisco. The user saves energy and money. The comfort level of space(s) will increase. The intuitive wireless interface simplifies operation. Quick installs are enabled by the wireless mesh network. The user does not have to cut into ductwork because the radial damper installs the front of the diffuser. Because the zone and central controller connect wirelessly, no new control wiring is necessary. The manufacturer says that a user can create a new zone and pairing a zone controller in under a minute. There’s a very short learning curve for operating the system thanks to its use of Android technology. 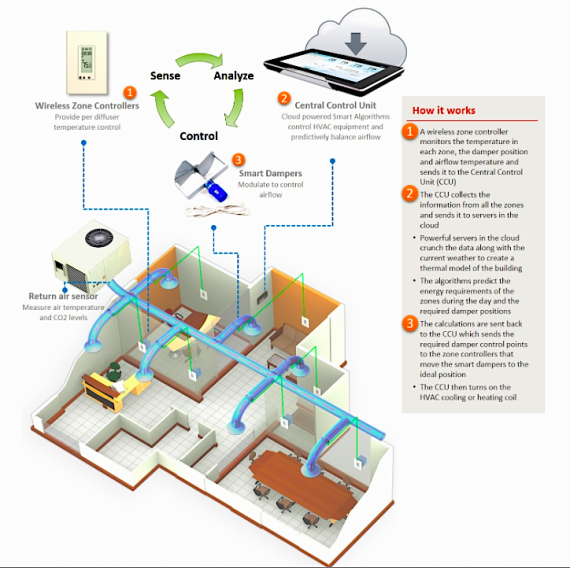 Facility managers learn this technology very quickly and appreciate the remote status monitoring, multiple security levels, built-in alarm systems, and feedback that supports learning and tweaking. Unlike crude traditional thermostats, the New Cool from 75F works proactively, using servers in the Cloud to model the building’s thermal envelope and predict heat loads based on daily weather data. It can even pre-emptively rebalance airflow to anticipate temperature drift. Also, the Cloud automatically backs up the entire configuration. As far as comfort goes, the new 75F system provides individual room comfort control, adjusts for perceived temperature due to humidity, and keeps temperatures within 1° F across all zones. At the bottom line, energy savings from the 75F can amount to 40%. Bypass dampers, either fully open or eliminated by the new system, no longer cut efficiency and become a concern of the past. Using smart algorithms to achieve DOE recommendations, the New Cool from 75F recoups its investment in under three years. Check out the 75F video right here. What’s wrong with this system? Honestly, it’s hard to say. It recently won the best breakthrough business idea award at the Minnesota Cup competition. Its premise — “The New Cool” — may be the most daunting aspect for some. The product’s name derives from the concept of raising the summer set point from 72°F to 75°F, as the United Nations recommended six years ago for its Secretariat building in New York. To a polar bear like me, this seems a tad on the high side. But then, I guess I could get used to it.